This is the time of years when our sarcasm kicks up. Everything we read suggests that hosting a 6-course Thanksgiving Martha-style is as easy as (pumpkin) pie. But creating an elaborate feast that nourishes family and friends is not a simple thing, particularly when each guest carries with them their own personal holiday bible. Since we make elaborate meals everyday for a living we can attest that it takes planning and work! But like anything that takes work, it can be a fantastically fun and empowering experience. A privilege. And it can be a whole lot easier if you start now. Just follow our timeline for a stress-free turkey day. If you get through these steps this week, the week of will be a joy. 1. Collect your recipe and table décor inspirations and pin them to a board above your desk or in your kitchen. Decide what you want to make and what you want to delegate and start delegating. Print or copy all recipes and place them in a folder to have on-hand during cooking. 2. Enlist your littlest helpers. If kids are coming, ask them now if you’d like them to make something special for the table. Sarah’s family still whips out laminated place mats her now-adult sister made for each person in their family. You won’t believe how sweet and chic they look on a table set with her mother’s best. 3. Make a detailed shopping list organized by store and by store section, e.g. produce, pantry, meat, bakery, wine, etc. You will be so happy you took the time to do this now when you have the time to relax with a glass of wine two nights before T-Day! Include ingredients for a green salad and a loaf of good bread. You’ll see why in the second week. 4. Make a timeline. Decide what dishes can be made ahead (e.g. cranberries and salad dressing can be made 2 days ahead and most desserts can be made the day before) and work backwards from dinner according to how long each dish will take. Pin timeline to your inspiration board. 5. Take inventory. 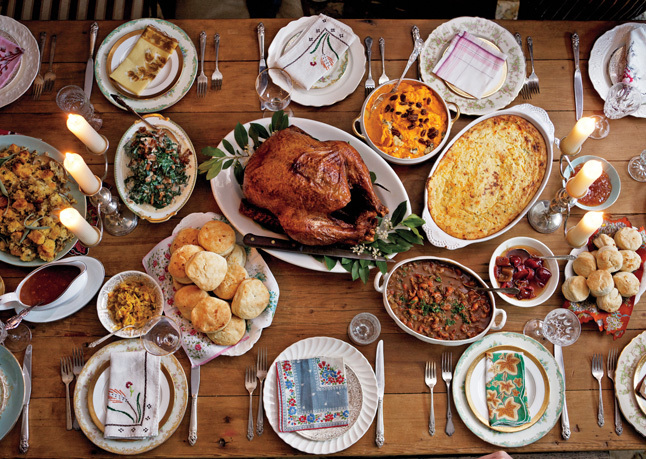 Make sure you have enough pots, pans, baking dishes and platters to prepare your meal and plate it. Count your plates and glasses. Now is also a great time to iron those holiday napkins and tablecloths and make sure you have enough candles to make your table glow all night. 6. Order your bird. Plan on 1-1/2 pounds of turkey per person. 1. Make and freeze your pie crusts. Cross those ingredients off your grocery list! 2. Make and freeze a good quantity of good soup. If you’re hosting the big day, chances are you have friends staying over the night before. You’ll be busy cleaning, prepping and catching up and you’ll be hungry. Surprise them (and yourself) with a light and healthy homemade dinner. All you’ll need is that bread and salad you already put on your shopping list. 3. Buy wine, liquor and sparkling water. Cross them off the list! Feels good, right? 4. Pick a table look from your inspiration board and buy supplies. Add necessary flowers and other perishables to your master shopping list. 5. Stock your pantry with good nuts, crackers, popcorn and buy a few hard cheeses and jarred olives. Now you have easy appetizers and nibbles for house guests. Cross ‘em off the list. What special steps are you adding? Julie, no one is feeling sorry for you! Paris awaits ;). That is a gorgeous photo, A&O! I’ll definitely be using this timeline in preparation for my California feast. Loved your soup idea! Made a big batch of vegetable soup to keep my vegetarian boyfriend fed through our meat-filled Tennessee Thanksgiving, but the whole family ended up loving it, especially the hard to please kids! One night of cooking ended up as one dinner and two lunches for lots of people – thank you so much!